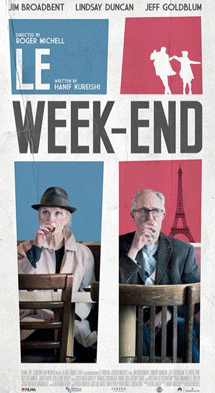 The French/British film Le Week-End has continued its Ann Arbor run at the State Theater, and so I caught it there on a matinee showing yesterday. 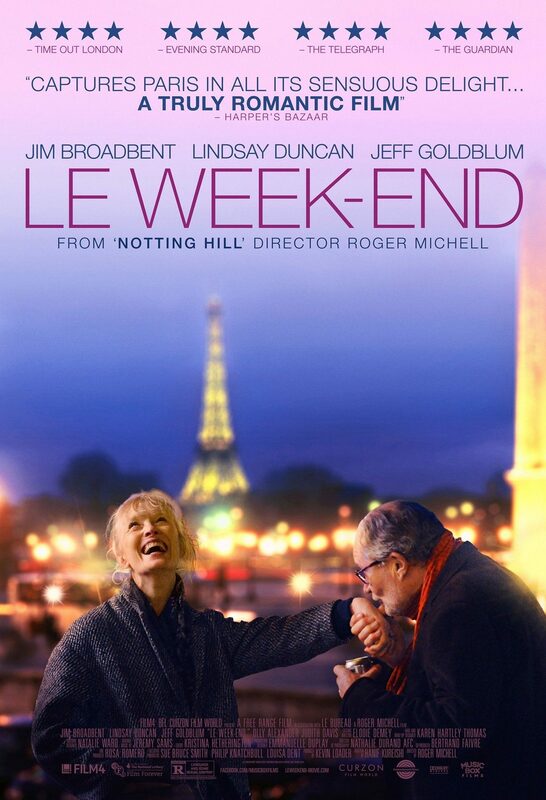 Billed as an elder-skewing romantic comedy to US audiences (at least) the film is in fact a darker look at longstanding relationships, as seen through the eyes of veteran actors Jim Broadbent and Lindsay Duncan, both of whom impress in the central roles, and carry the film solely on their shoulders for nearly 2/3 of the running time as a long-married couple from the UK visiting Paris for their anniversary. Broadbent offers a character that could be seen as a parallel universe sequel to his work in Another Year a couple of years ago. In the earlier film, he was happily married and ensconced in London life, but this time, he’s not so happily married (though still officially so) and reeling from some unexpected developments in his university job. I find that Broadbent has become known for an affable, twee presence in some of his more recent roles, and here, he darkens the shadings nicely, recalling some of his earlier work such as Moulin Rouge! although not as extravagantly so. Duncan captivates in her role, showing a believable mix of tenderness and abruptness, combined with questioning how much of her own feelings to let on or instinct to follow. It’s a pity that the actors are let down by the construction of the film, which starts and ends very awkwardly and can’t decide it it wants the characters to be quirky or realistic. I think this is some combination of writer/director challenges – IMDB tells me that both of them (Hanif Kureishi and Roger Michell) have collaborated frequently, but they seem to have lost their stride with this effort. Just as an example, the film should have started about 10 minutes past when it did start, and the ending is a total “let’s throw in the towel” crapshoot. The film does add more subtext for its last third, when the couple attends a dinner party given by a friend of Broadbent’s, played by Jeff Goldblum in a charismatic performance, and are faced with the awkward (yet familiar in a social setting) choices of putting on a show or letting their current strife show to people they barely know. The technical composition of the film is also at its most intriguing here, with moody evening shots of the Parisian skyline seeping through into the apartment and several long shots of a metal stairway emphasizing shadows and construction. I definitely wanted to see this film do a better job of telling its story – but I’m not sure how it would have done that. Nonetheless it is refreshing to see a film carried by “older” actors and not afraid to be downbeat and take chances in how its story is unveiled. I also found that the UK and US advertising seemed to convey a slightly different interpretation of the plot as seen in pictures. Both examples are below. Posted on May 3, 2014, in Movies. Bookmark the permalink. 1 Comment.